Various Artists - "The Vegetable Man Project: Vol. 1"
Gastel Etzwane opens the set quite simply with someone (I believe it's project organizer Dario Antonetti) singing the song in the shower. Pulp_Ito do an ultra spacey hypnotic version with a gothic flair. Effetto Doppler starts off as a heavy rock tune but quickly switch to a raw thrashing space-punk melee. See the review of their debut CD this issue. Yulan do a dreamy psychedelic version of the song with beautiful wailing guitar lines that sound like Robert Fripp in some of his more serene moments, but soon becomes more overtly psychedelic, and then more roughshod garage-psychy. I love this one. Mandragora isn't the British festie band Mandragora, but an Italian combo I'd never heard of who play a cool psych-punk rendition of the song with a freaky spacey bit at the end. Delavega begins the song very much in Pink Floyd style, but then surprised me by transitioning to a loungey jazz and Blues groove. Donna Vegetale do a nice folk-psych version of the song. Krut 182's contribution is a killer chaotic doomy thrash garage-psych version. And at over 6 minutes it's the longest track of the set with lots of freakout jamming. One of my favorites! Castemore do a short cover in a traditional Celtic style, but then goes off into an old time country Bluesgrass jam. Wild! Menazone play a robotic electro rock interpretation of the song. Like several of these tracks, Sixtynine And The Continuous People start off as a Pink Floyd styled cover, but then they do a 360 degree turn and blast off into a surf-punk jam. Max plays a lo-fi garage rock rendition of the song. Gnu does a strange Tom Waits in a car crash version. Potage begins very similar to Gnu. In fact, I had to check the credits to verify they weren't the same people. But they do finally go off into their own psychedelic rock n roll freak ride. Annavoid perform a strange but intriguing mixture of heavy metal and psychedelia, but also with a dreamy melodic keyboard/piano section. Very cool. Across the Atlantic in the USA we have Texas psych masters The Linus Pauling Quartet, who begin in a standard Pink Floyd style, but then blast off into total psych jamming manna from heaven. Excellent! Yet another Texas psych legend is Tom Carter, whose heavy psych rock version of the song includes yet another completely spaced out bubbling psychedelic trip segment. Mr Free City Media, Nick Bensen, does a version of the song that would fit perfectly on his No Resistance CD. Kable play an intense but raw proggy rock n roll cover. Finally, Drona Parva's entry is one of the few tracks where the song is unrecognizable as being "Vegetable Man". It's an eerie, drifting glom of drone and valium laced chant. Interesting. Overall this is a quite an interesting collection and there are several bands I've noted to check out further. And if these 20 tracks aren't enough, Dario is working on The Vegetable Man 10" Project which will involve 300 artists from all over the world and will be much more experimental, each having exactly 10 seconds to express their interpretation of the song. 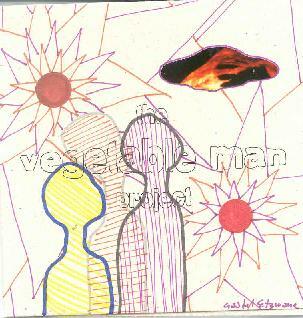 For more information you can visit The Vegetable Man Project web site at: http://www.oggettivolanti.it. Contact via snail mail c/o Dario Antonetti; Via S.Cristoforo 7; 23841 Annone Brianza (LC); Italy.